The new movie "My Piano" (Horowitz-rul Wihayo) has a plain and a rather predictable storyline _ a troublesome boy with a talent for the piano learns how to communicate with the world through music thanks to his teacher _ and it is delivered without big ups and downs. But a series of small yet interesting episodes work as tasteful spices in the movie, saving it from becoming a total flop, and some classical music pieces played by skillful actors help it stay enjoyable. 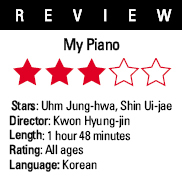 Directed by Kwon Hyung-jin, the film revolves around Kim Ji-su (played by Uhm Jung-hwa), a 30-year-old single woman who used to dream about becoming a world-class pianist but ends up opening a small neighborhood piano school on the outskirts of Seoul. She meets a boy named Kyung-min (Shin Eui-jae), who shows up and pesters her for no apparent reason. He is a headache at first, but after she discovers his great musical talent, her goal becomes to turn him into a renowned pianist like Vladimir Horowitz. However, what she really wants to achieve - behind this ambitious plan - is to gain the reputation of being a great piano teacher, which will lead to the success of her small piano school. Things are different and as not easy as she thinks. Kyung-min, who lives with his grandmother after he lost his parents in a car accident, tries to keep his distance from other people as a result of his misfortune. However, music, which Ji-su uses as a tool for her success, helps her communicate with the boy and later she realizes that what the boy really needs is love, and her relationship with him then becomes almost maternalistic. The story can be seen as too instructive with a cliche theme, but it has enjoyable moments as veteran actors give funny performances and classical music pieces, help amuse audiences throughout the film. Stepping out of her usual image as a single, successful career women in her previous feel-good romantic comedies, Uhm successfully portrays a mother figure and delivers the character's inner angst. Child actor Shin, who won the first prize at a piano concurs competition in 2004, seems to have a great talent for acting as well as music. Throughout the film, he shows this by playing a series of classical pieces and portraying a troublesome boy in his debut work. Actor Park Yong-woo, who plays a man too shy to have a girlfriend in his latest hit Romantic Comedy "My Scary Girl" (Talkom, Salbolhan Yonin), produces an hilarious performance in his clumsy approach to Ji-su after he develops a crush on her. Given that not many local films featuring music have been successful, this film could've been a risky attempt by the director. But it seems that he tried to reduce the risk elements by using formulas adopted from successful films with similar motifs, which resulted in a decrease in the sense of originality and made the movie seen plain and predictable. Overall, it's hard to find big flaws in the film, but due to its plain storyline, it ends up being a film without any strong hooks, either, despite some enjoyable elements. The Korean animation "My Beautiful Girl, Mari" directed by Lee Seong-gang will be shown on Japanese broadcaster NHK. The animation is scheduled to be aired on June 9 at 11:00 p.m. on NHK's satellite channel BS-HI. According to KBS on May 23, KBS World, KBS's overseas network, will transmit programs in Thailand. As such, KBS World will sign a program transmission contract with 213 nationwide cable service operators in Thailand on May 26.